A routing accessory built to work with Daedalus and amp FX loops. 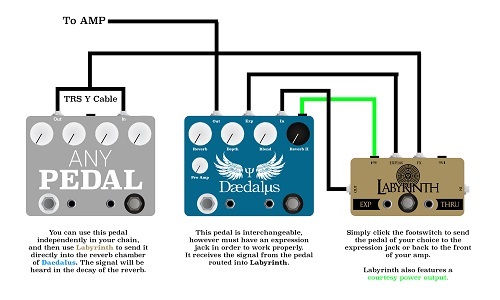 With Labyrinth, players are able to place effect pedals into the reverb chamber of Daedalus via the expression jack, and then remove them to place them back in the “general signal path” with just the click of a switch. This accessory will also work for players who go back and forth between using front of amp timed effects and back of amp FX loops. You’ll needs some TRS cables to make it happen. Check the diagram below for details.